In 1983 Lieutenant David Keenhold was heavily focused on his work in his office at the Monroe County Jail, New York. He was acting as warden of the facility, and was writing his daily paper work, when a guard quickly stepped in to report that something strange was happening with one of the inmates. The guard, noticing something weird, pointed at Keenhold. Keenhold looked down to the area the guard was pointing and saw that his shirt, and all around the back of his chair, was saturated. Keenhold had no idea where the water had come from, as he had been working in his office for quite a while, and surely he would have noticed that much water soaking his clothing. The guard however had an explanation. 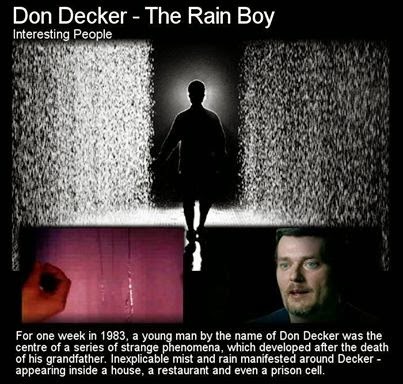 One of the inmates, Don Decker, claimed he could make it rain anywhere and at any time. The guard led Keenhold to Decker’s cell to find water running down the walls onto the floor. A few days prior Decker had been given a one weeks furlough from his cell (he had been convicted of receiving stolen goods and was doing 12 months behind bars). His week of freedom was so he could attend his grandfather’s funeral. As friends and family gathered for the ceremony, and gave small talks about the positive contributions to society and the all round good life the recently deceased had lived, Decker was slowly being worked up by his own memories. His grandfather had physically abused him as a child. Later that night Decker went to stay with some friends, Bob and Jeannie Keifer, and over dinner, he continued to stew over the memories that had been brought back up during the funeral. He excused himself from the table to go to the bathroom, so he could collect himself and calm down. However, now alone, his feelings came out in an emotional outburst. As this happened, the temperature in the room drastically dropped, and Decker saw the image of an old man, resembling his grandfather, but wearing a crown. Following this he felt a sharp pain in his arm, and looking down he saw three bloody scratch marks. Looking back up the figure was gone. Puzzled, he went back downstairs and rejoined his friends back at the dinner table. It is at this point things get a little hazy for Decker, but his friends could recall what happened with vivid clarity. For brief points throughout the meal Decker would go into an almost trance-like state, where he would just stare into space and would not react to conversation. After a few of these trances passed, something else strange began to happen – water began to slowly drip from the wall and ceiling, and a light mist would form on the ground. The buildings landlord was called to see to the water problem. When he arrived, along with his wife, he checked the house, but could not discern a reason for the leaking, as the pipes were located at the other end of the house. Decker went into another trance-like state, and even more water began to run down the walls and from the ceiling. Another curious thing happened… the water droplets in the mist would jump up out of the mist to arc through the air and back to the floor. The landlord wanted to get to the bottom of things, so asked everyone to leave and sent them off to have a meal at a local restaurant. The restaurant owner was a friend, and when Decker and the Keifer’s arrived, they related the tale of what was happening. The restaurant owner said she believed it was the work of a possession, and that Decker’s body was playing host to something evil. At this, the water started to drip in the restaurant. It was only after leaving the restaurant, and the rain once again following Decker, that the party was now convinced that Decker was, in fact, the cause. Intrigue turned to anger as the landlord, who had waited, started loudly making accusations at Decker. At this the rain got heavier, and Decker, apparently unable to control himself, jumped backwards across the room landing in a heap on the floor. Not knowing what else to do the Keifer’s contacted the police, who sent out some officer’s to see to the disturbance. When they arrived, they could not come to a satisfying explanation for the phenomena and called their chief. The chief arrived, took a look at the scene, and ordered his officer’s to leave and not to mention it to anybody. However, the phenomena was all too intriguing, and the following day the two officer’s arrived back on scene, where they say they saw Decker take another fall/throw/jump, and this time three claw marks were found on his neck. What else could the group do except make contact with priests and ministers and see if they would come out and perhaps perform a exorcism to remove whatever it was that was attacking Decker, and causing the rain. Many refused and it all fell to an evangelical preacher to perform a ceremony. The ceremony appeared to work, the rain stopped and Decker was free from his trance-like states. Several days later Decker’s leave from incarceration was over, and he was transferred back interstate to the prison.That night, the acting warden had his shirt soaked, and witnessed the raining in Decker’s cell. Apparently when the guard had confronted Decker about the water in his cell, he replied by saying he could make it rain anywhere and at any time, to which a guard responded why not make it rain in the wardens office. Thus the warden was soaked. The warden, being a religious man, called on Reverend William Blackburn to perform an exorcism in Decker’s cell. After the Reverend seemingly made contact with the entity harboured in Decker’s body, the ritual began and only lasted a few minutes, before Decker was freed. Since that time Decker has had no problems, and the rain had stopped. He believes it was his grandfather’s spirit, once again causing him pain and anguish. All who had witnessed the events have been interviewed on various programs and magazines, and all have kept a consistent story for the past 30 odd years. What do you think took place for that week in 1983? Photo: Inset left: A photo of some of the water running down the walls. Inset Right: Decker about 25years after the incident.